Since I am paying attention to planning my meals, what I am eating and accomplishing certain tasks during each day, it causes me to approach each day more mindfully, which makes me feel more in control of my time. It is easier to wake up early in the morning. Eating healthier, not drinking alcohol and clearing my mind seems to make waking up in the morning more “natural.” This may also be due to the fact that the sun is rising earlier, too. Since I exercise early in the morning, being able to get out of bed with more energy feels great! I don’t think I’ve lost weight yet, but I just feel better around my waist. My stomach feels flatter and tighter and I generally feel better all around. It’s only been a week (not even) so it is nice that just a few days without flour and sugar can cause me to feel this way. It is a good feeling to do a good job at something! This is part of feeling in control, but I think for me, I get motivated by a feeling of accomplishment. It was a really dark, rainy morning, so I did enjoy sleeping in a bit. I got to work soon after getting up and promised myself I would go to the gym later, which I did. I picked up some salmon at the grocery store, and some fresh green beans. I had a very productive day at work. I had planned to take the day off to ride my bike into the city to see a popular art exhibit. It is only in town for another week, and you have to wait in line to get same day tickets. The rain was so heavy and miserable, that I bagged that plan and set my mind to decluttering my inbox of all the things I had been putting off all week. 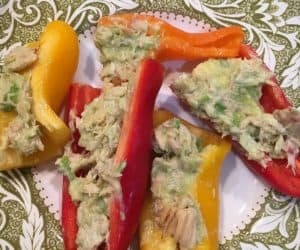 For lunch I made some tuna salad with avocado and yogurt, and served it on mini peppers. It was good! Dinner was salmon with quinoa. It wasn’t great – I overcooked it on the grill, but it wasn’t bad either. I am not a very attentive or patient chef!